I woke up to play the tournament sans my wallet. My green card, drivers license, and about 1300 Euro. Oh well, things happen and I'm not gonna dwell on that, it's all been taken care of. I was seated at a table with Peter Eastgate and fellow Team PokerStars Pro Lex Veldhuis. I'd never played with Lex before, all I knew of him was what I saw on the ESPN broadcast where he showed every single bluff he tried, lol. Many of those bluffs were rather "out there" to say the least, but every one of them seemed to work. He started out the day playing as I expected. Re-raising out of position, playing lots of pots and really looking to mix it up. Our styles could not be any more different. He hates my small ball approach, and the feeling is mutual for his tournament strategy! 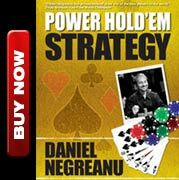 I think he is an excellent no limit hold'em player, but like many great cash game players he doesn't make some of the adjustments I think are necessary to consistently get deep in tournament poker. Guys like him, Durrrr, and David Oppenhiem often find themselves in situations that I think they could avoid, simply because their edge is bigger at the table then they think. They are usually the best poker player at the table, and could learn from a guy who "thinks" he's always the best poker player at the table- Phil Hellmuth. 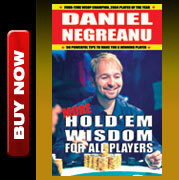 All three might be better poker players than Hellmuth (they are), but Hellmuth actually has a much better tournament approach versus amateur players than those players with more no limit skill than he has. He plays a far less sophisticated game, but a typical tournament, especially on day one, simply doesn't require much in the way of creative, sophisticated play. In fact, playing "above the rim" is often the less optimal approach in the early stages where the percentage of weak players is highest. The safest, and most profitable approach is to take advantage of the mistakes that your opponents will make. Let the game come to you essentially. Anyway, Lex was en fuego in the first 30 min and jumped to a healthy lead of about 90,000! I stayed steady for most of the day in the 35k range. Before dinner I played a hand badly against Lex, where I had Ah Qc on a flop of Qh 10h 8h, and was down to 10,000. After dinner, I started to finally pick up some hands and hit some flops, and ended the day over the 100,000 mark with 106,700. A great finish for me. While my poker day got better in the late stages, the best part of my day was getting an e-mail from my brother telling me some really good news about my mother. She's been infection free for a couple weeks now and that's allowed her to really make some progress this week. They had her sitting up in a chair for a while OFF of the life support machine, she was more alert than ever, and my brother even said that she was trying to talk and he could read her lips! That's a pretty big deal.